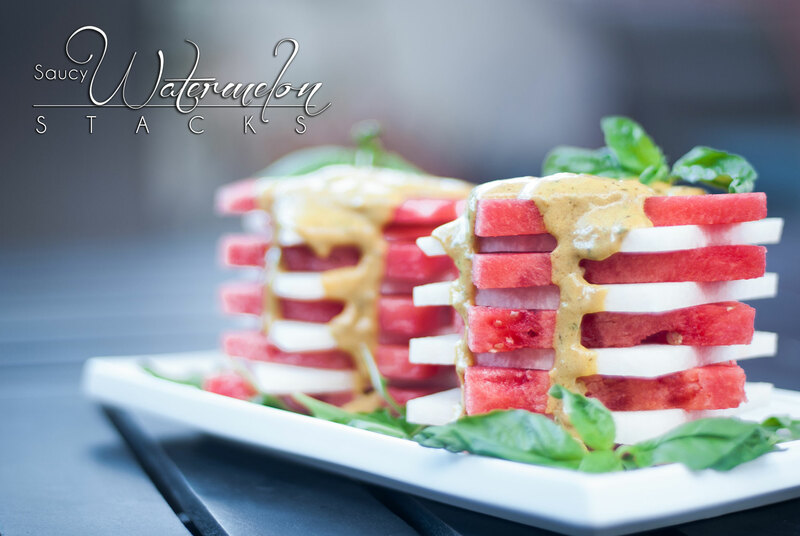 This summer Saucy Watermelon Stack will surprise you. 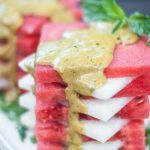 Accidentally discovering that this sauce is truly amazing on anything when the only thing left on my plate was a slice of watermelon and a dollop of sauce, it was obvious that it needed to be shared! You may have noticed that we've been a little quieter on the blog in the last few weeks. We are working on our first ebook to sell! (So watch for that, and subscribe for updates if you haven't already). I am also busy redesigning the website (something I've wanted to do for ages now), which I'm hoping I'll have done by the end of summer – weather-dependant…. And there was a third thing I was going to mention, but I don't remember what that is. Oh yeah, I have another move coming up. Yes, I have to leave this beautiful space that I'm in. I am so lucky to have been here for the past year but it's time to leave. I'm planning on putting my things in storage for a few months and becoming a nomad for a bit. So if you have a beautiful space for me to crash in for a bit, please let me know! 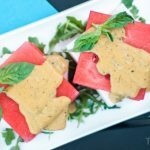 Just a few days ago I found out that The Primal Desire was listed as a Top Healthy Recipe Blog by Mamavation! What an incredible honor to be recognized and included in so many amazing sites! Leah Segedie reached out to us directly and invited us to ShiftCon, an “eco-wellness influencer conference focusing on food, wellness, health, sustainability, and platform growth”. OK, I had to look into this all a bit before I got really excited. It's not like I read mom blogs, so I was not aware of Mamavation. But I'm so glad that I am now! Please take the time to read this write-up about Leah. She has done some really incredible things. And upon reading about her accomplishments and what drives her and what she's doing with this conference I was really excited to be invited. It's about educating our audiences and about creating change to make things better for all of us. Getting access to real food. Improved labeling of all products including beauty products (you're seen that we are now working Beautycounter, right? No?! OK, check this out right now!). We're excited to be connecting with this community and are looking forward to bringing you more information as a result! For our wellness blog friends, this conference is open to you too, and we'd love to see you there! It's being held in California on February 1-3, 2018. Get your tickets HERE. 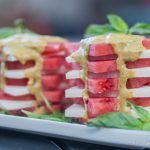 Also, Leah has provided us with a ticket to give away to a fellow blogger, so we are holding a contest for that (look below the Saucy Watermelon Stack recipe to enter). *Pick a watermelon and jicama that you will be able to get a 4-inch square out of. Cut off the top and bottom of the jicama, then square it up by cutting off the sides. Lay it on its side and cut into 1/2-inch slices. Do the same with the watermelon. 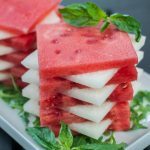 Stack the squares alternating watermelon and jicama slices, in whatever pattern you like. Pour sauce over top as desired. Heat ghee over medium heat in a saucepan and saute garlic until golden brown. Add turmeric and continue to heat for another minute (move to next step before turmeric starts to burn). Add cream mixture, cooking for another 5-10 minutes (gently boiling) cooking down until desired thickness. To be clear: This contest is only open to other bloggers. « Holley’s Super Simple Smoothie Mix- 3 Ingredients! That sauce!!! 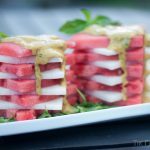 I love fenugreek, I bet it’s just amazing drizzled over this beautiful watermelon stack. Ooo what a lovely sauce! Yum! I would have never thought to do this! What a gorgeous recipe! 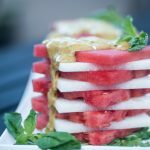 I love that you made a savory dish with watermelon. Sounds perfect for the summer. Hope all goes well with the big move and congrats on making the Mamavation list! How creative! And…. most importantly, also tasty! 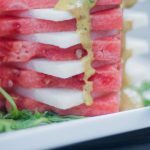 This is so cool – I’d never think to put a savory sauce like this on watermelon but it sounds amazing! 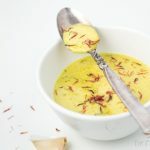 I love fenugreek – such a unique but wonderful flavor. Michele, I’m always looking to make things more savory! These stacks are so beautiful, and that sauce looks incredible! 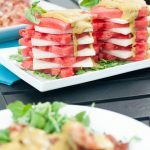 Love watermelon in the summer and this version is perfect for entertaining ! It makes it look so special for friends and family ! All about this recipe. Just bought a watermelon too. Meanwhile my blog at fishmanfit.com is all about healthy lifestyle! Partnered with my YouTube channel and Instagram I hit all the major outlet. Fitness, food and FUN! This is just divine. Reminds me of spiced watermelon, jicama, cucumber and avocado snacks we would have in Mexico as kids. I love the sweet/savory/ juicyness of it all. yum! You spent a lot of time in Mexico as a kid? Lucky! What were these snacks spiced with? These stacks are beautiful and I’m sure so delicious! That sauce looks amazing! SWEET! Looking forward to meeting in person! Couldn’t find any fenugreek in town, so I have substituted dill. Since I am using it as a dip with a vegetable tray, I added cream cheese, too (this is a primal site, right?) I has nice flavour, and is very rich. Will see how it goes over at the party this afternoon. Sounds good Mom. Let us know how it goes. How did it go at the party? This looks so much fun as well as deliciously tasty, love these fun recipes! Wow, am I ever happy that you found us and commented! I just checked out Primal Play. I was just talking about missing “play” movement this weekend. I’m excited to learn more about your system! Looks so gorgeous and love that there is jicama in it! Haha, I love the name, and this is so cool looking! Eating more paleo style these days so lots of your recipes look tempting! Fingers crossed for a win. Thanks!